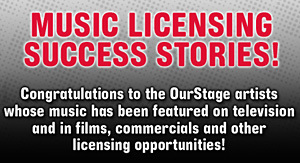 Enter your best original music into any of OurStage's genre-based channels for your chance to win. During the last two days of each month, the Top 10 in each channel* will roll into one of our five finals channels and compete to win the Grand Prize, which may evolve month-to-month. For February 2015, all qualifying Grand Prize winners will be featured on Amazing Radio, with an international listening audience of hundreds of thousands, and will be evaluated for other promotional and career opportunities. Additionally, we will select editor's picks from all of the genre channels to feature on Amazing Radio.